Corelis offers an extensive line of boundary-scan software pieces that can be custom tailored to create the right package for any user. Corelis' boundary-scan software is compatible with Microsoft® Windows XP and Vista as well as all of Corelis' hardware platforms. ScanExpress TPG™ is a next generation intelligent test pattern generator that takes the process of boundary-scan automation to a new level in both performance and ease of use. ScanExpress TPG automatically generates test patterns that facilitate pin-level fault detection and isolation of all boundary-scan testable nets on a printed circuit board (PCB). ScanExpress TPG also creates test vectors to detect faults on pins of non-JTAG components such as clusters and memories that are surrounded by IEEE-11149.1 compatible devices. ScanExpress JET™ represents a quantum leap in automatic circuit board testing by extending boundary-scan structural test coverage to virtually every signal on the board that is accessible by an on-board CPU. 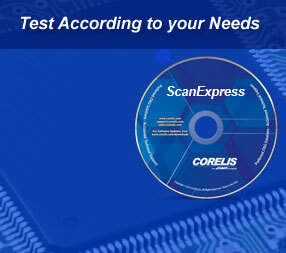 ScanExpress JET utilizes proprietary "JTAG Embedded Test" (JET) technology, which uses a processor’s JTAG debug port to download and control native processor code to perform at-speed functional testing of the UUT. ScanExpress DFT™ Analyzer is able to accurately calculate the test coverage of boards and systems that include a mix of both boundary-scan and non-boundary-scan devices. The software additionally helps development engineers detect low coverage areas on their designs allowing them to make decisions on increasing fault coverage before the board is sent for layout. ScanExpress Merge™ makes system-level boundary-scan test development a snap by automatically combining multiple target assemblies into a single boundary-scan compatible target system. The tool provides automatic handling for each board netlist, scan-chain, and interconnect information. ScanExpress Runner™ provides a runtime executive environment that is friendly for design, production, and field service. ScanExpress Runner allows users to create a test sequence and execute that test sequence any number of times with consistency. A truth table diagnostic display is included to help pinpoint failures down to the net and pin level. ScanExpress Runner Gang™ is the workhorse software piece to perform parallel gang testing and In-System Programming of CPLDs and Flash devices. This solution is fully concurrent and allows simultaneous testing of multiple boards using a single PC and a single operator. ScanExpress Runner Gang addresses high-throughput boundary-scan applications including high-volume production. ScanExpress ADO is an add-on option for the ScanExpress Runner and ScanExpress Runner Gang execution environments. The Advanced Diagnostics Option automates test vector analysis by intelligently deciphering standard truth table diagnostic information and presenting specific fault information to the user in a detailed verbose format. RunnerClick is a special purpose Windows application program specifically for contract manufacturers that is designed to minimize operator errors and further simplify the test process. 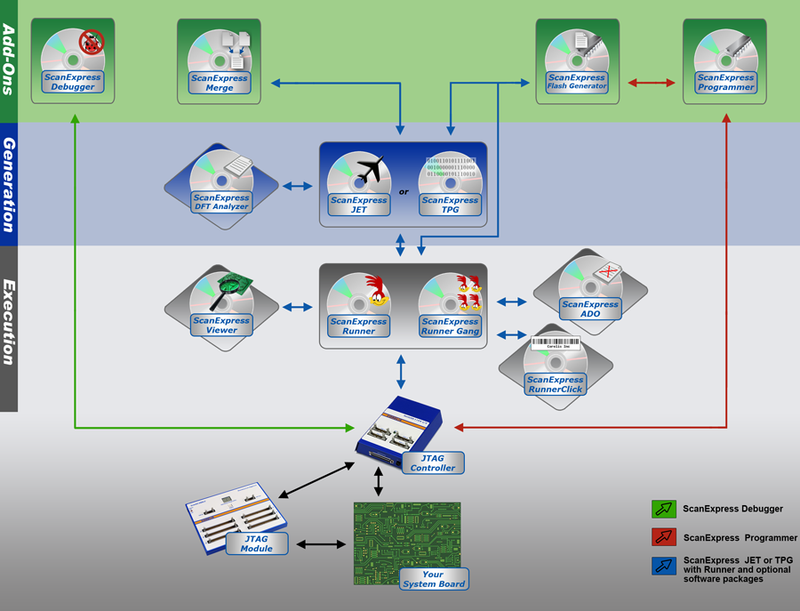 ScanExpress Viewer™ is a powerful graphical fault identification system that helps to isolate the source and location of faults encountered during boundary-scan test of printed circuit board assemblies. The device and pin location capabilities provide test operators the immediate board location of the faulty pin or net. ScanExpress Debugger™ provides a simple, stand-alone environment for complete pin control over any boundary-scan device. The interactive graphical user interface lets users mimic the functionality of a logic analyzer by observing all boundary-scan controllable inputs while also providing the capability to drive output pins to specific logic states. The software can be used to quickly apply patterns to specific areas of a board giving immediate feedback when faults are detected. ScanExpress Programmer™ is a universal in-circuit programming tool that can program and verify Flash memories, serial EEPROMs, CPLDs, FPGAs, and other programmable logic devices. Programming methods include JTAG, I2C, SPI, and Target Assisted. The extensive device library includes chip manufacturers such as Actel, Altera, Spansion, Intel, Microchip, STMicroelectronics, Texas Instruments, Xilinx, and many more. The ScanExpress Flash Generator™ creates a Board File, which is used to provide ScanExpress Programmer™ (or other compatible applications) with the necessary information to program a given target board configuration. 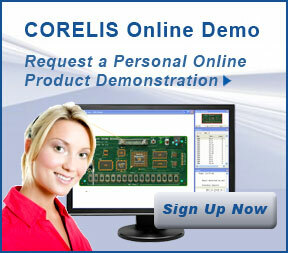 Corelis offers several files conversion utilities as well as diagnostic software.